In Thailand, elephants are trained to perform a number of tricks, from playing soccer to drawing to stepping on the backs of vulnerable tourists. 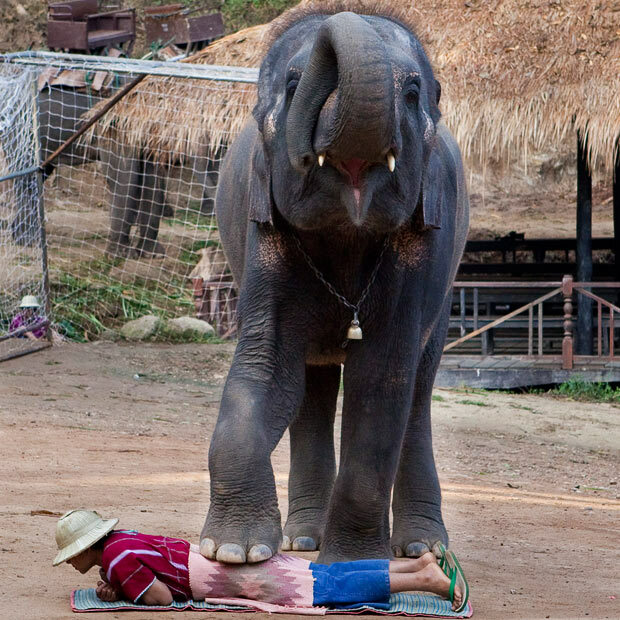 The Maesa Elephant Camp in Chiang Mai features elephants of the latter type: While you lay on your face, the elephant will step on your back to “help ease your stress.” Ninety-nine percent of that stress, of course, comes from knowing that the 3 ton beast is capable of crushing you like a slug. Sometimes the tourists are given the impression that a baby elephant will be doing the stepping, only for it to be switched to a fully grown adult one when it’s too late to turn back.